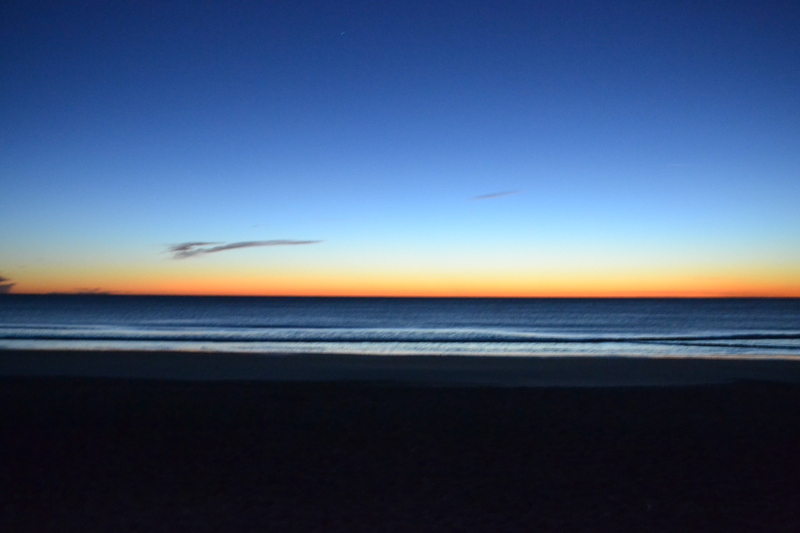 The predawn light at 6:38 a.m. on Feb. 1, 2013 on Main Beach, Amelia Island, FL. 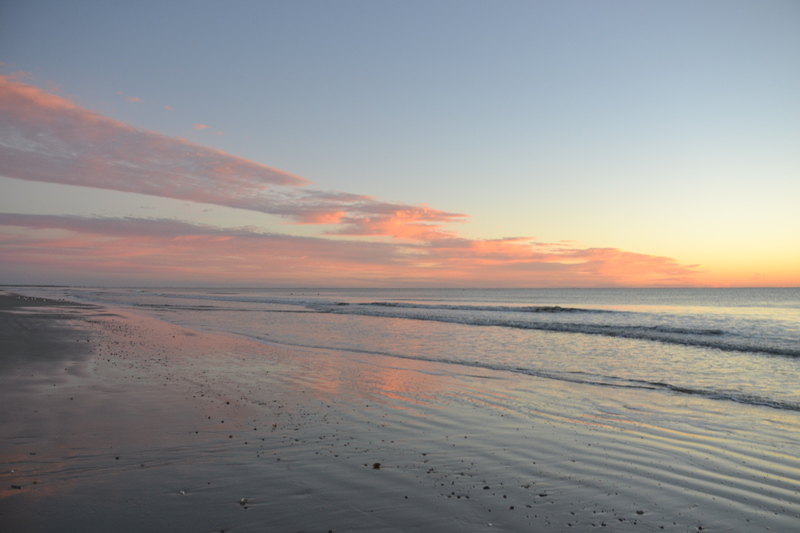 I stood on the beach bathed in the pale pre-dawn light. I had gone there to photograph the sunrise over the ocean. The air was chilly, but unusually still for the seashore. The Atlantic shimmered, uncharacteristically placid. With the tide in, the waves rolled gracefully onto the shell-strewn shore. 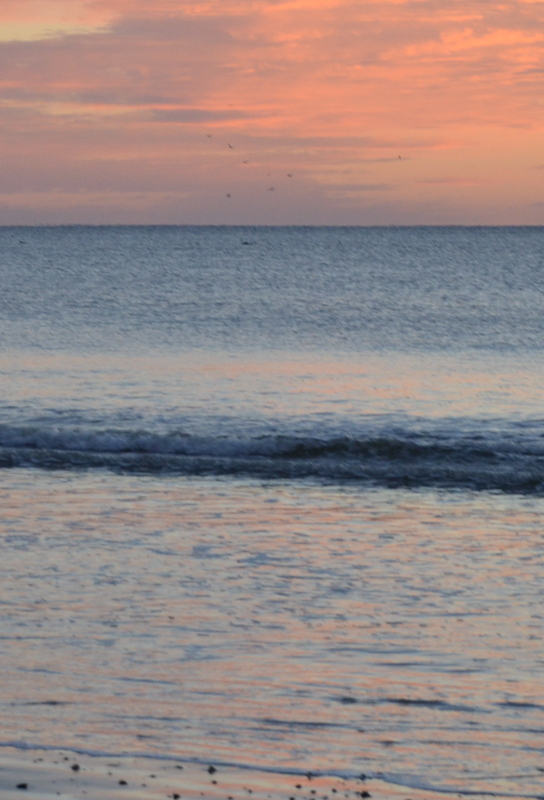 I wasn’t the only human on the beach at 6:45 a.m. A few other brave souls were also out before sunup. A silhouette jogged in front of me. Another walked the water’s edge towards me in a hitched gate. 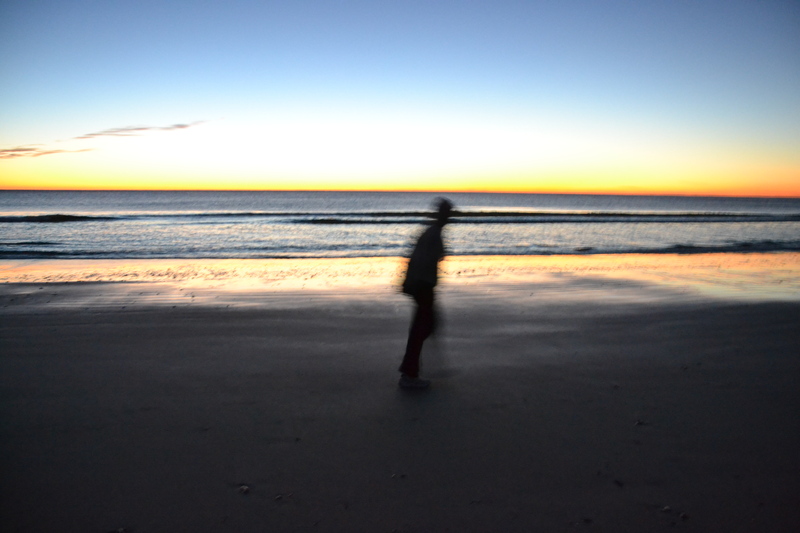 An early jogger zipped by me in the half-light along Main Beach, Amelia Island, FL. All the while, I snapped away, capturing the thin orange line that divided the dark violet sea from the turquoise sky. I wanted to digitally document the gradual, subtle color changes of the new day’s sun. We few humans weren’t alone as the sky slowly brightened along the beach. Groups of first year shorebird chicks scurried at water’s edge, probing and pecking for food. Careful not to get their tiny feet wet, they darted at the ebb and flow of the frothy wavelets. 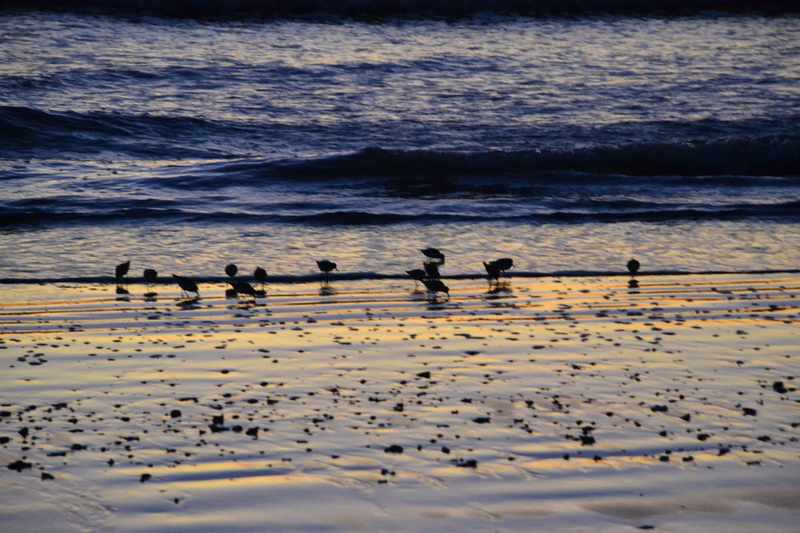 Young shorebirds feed at the ocean’s edge. Not far off shore, Northern Gannets fished for breakfast in their dramatic style. They circled with their long pointy white wings marked black as ink at the tips, and then plunged into the seawater. Satisfied, they again ascended and started the process all over again. A little further out a pod of dolphins arched in and out of the water. Their fins revealed their foraging path. 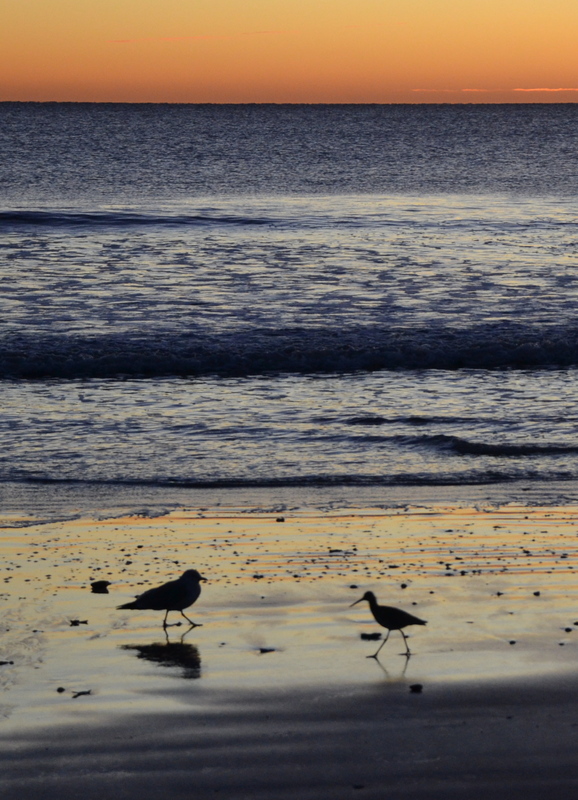 A gull and a Willet faced off on Main Beach in the early morning light. A lone Willet snagged a snail from beneath the sand. Seeing an opportunity for a freebie meal, a Ring-billed Gull unsuccessfully chased after the skinny-legged bird. The Willet swallowed the morsel before the gull could steal the bacon. Flocks of Black Skimmers winged just above the ocean surface, their lower beaks breaking the water in their feeding. They were out of sight in seconds. By now, the lady with the gimp caught up to where I had stood for 20 minutes. Seeing that I had a camera, she berated me for standing pat, and beckoned me to where the water lapped at the firm sand. It was there that the best color reflected in the receding water and against the few clouds in the northeast sky. Clouds to the north beautifully reflected the rising sunlight. As we admired the pastel radiance together, a whale broke the water. This unexpected find disappeared and our eyes searched until the first of many waterspouts blew high into the air. Birds circled above the Humpback Whale, making it easier to follow with the naked eye. The blow spouts drew my attention to a congregation of gulls circling above the whale like an avian tornado. They simplified our whale watching. Just follow the birds, and glimpse the whale. I later learned that it was a Humpback Whale, my first ever whale sighting. Amid all this activity, I continued to snap picture after picture of the ever-changing sunrise. Just as the sun finally peaked above the horizon, yet one last gem sparkled. I would have missed it if it hadn’t been for the older lady from New York. She pointed out the sun’s low-angled rays glistening in the crest of the waves as they broke upon the shore. They were golden jewels in an aqua crown. I remembered seeing the effect in paintings and thought the artists had overdone it. Now I knew they hadn’t. In precious minutes, the bejeweled waves disappeared, replaced by white-capped cousins. The sun was ablaze, bathing the seashore with its warming light. 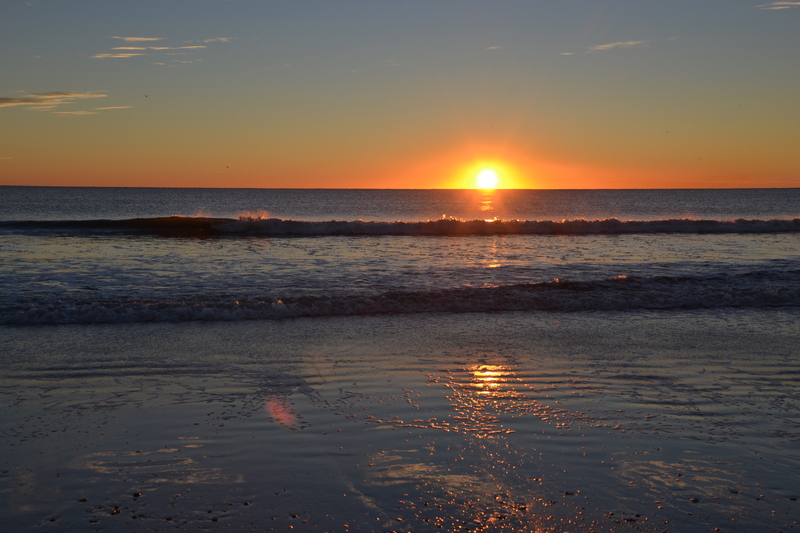 I had gone to the beach to take pictures of the sunrise. I left enriched with so much more. The jewels in the crown of the waves made the sunrise even more spectacular. As we returned to Maine a few days ago from the Virgin Islands we can relate to your beautiful photos! However, it snowed another 8 inches here yesterday. White sparkling snow…instead of the white sand of last week! Indeed, both are beautiful to behold. I’m glad you got a chance to enjoy the warmer climes for a while, too.